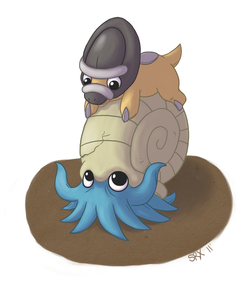 Shieldon and Bastiodon, similar to Omanyte and Omastar, were a complete shock to me. I got the Shieldon/Bastiodon zukan in my first lot of Gacha capsules, and I was struggling to narrow my collection down. I kept looking at the zukan, and in the end, it dawned on me - I loved them! So my collection was born, and it's grown so well - I'm very, very proud of it. The item that started the collection! I remember being surprised at how small they were - I always pictured Bastiodon as some huge beast! But, even at 1/40 scale, he's fairly small - so small in fact I frequently muddle the Clipping Figure and the Zukan figure up! 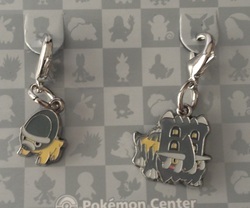 These are the cutest charms ever. 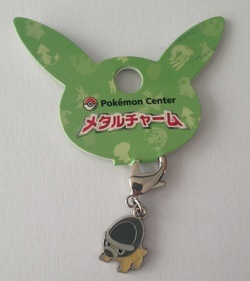 Made for the 2012 Pokédex set of charms, where by all pokémon had new charms sold in the Pokémon Centre in Japan. Can you spot the bootleg? Right! The one on the left of your screen is the bootleg - notice how he has no eyebrow piece? 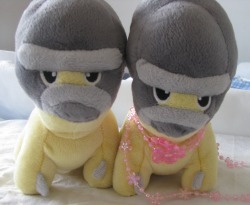 Anyway, the Mascot plush were produced after the 11th Movie, and are made of some kind of flat, furless material with felt details and a little stretchy loop to add them to your keys. They're about four inches long by two high - truly the babies of the bunch! 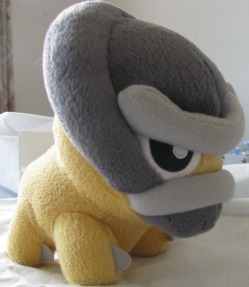 This plush was made in 2008, and is a kind of soft, velboa material. He's an almost-pokédoll style, emphasized by his HUGE head and tiny body! Mine goes by the name of Grinch, because he's so unhappy. This is Dora and Dwayne, my Jakks Shieldons! These were made in 2009, and are a minky-type material, so super soft. I got Dwayne on Amazon, and, when I bought Grinch the Banpresto Shieldon seen above, the lovely xxcutesnakeyxx from LJ threw in Dora, too! So they are my first pokécouple. Aren't they adorable? 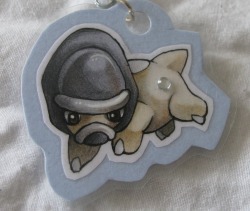 Yes, my little baby Shieldon is in a movie! He stars in the 11th movie along with Shaymin, Giratina and the usual pokémon gang. And of course this helped boost his merchandise, including this cute kid. 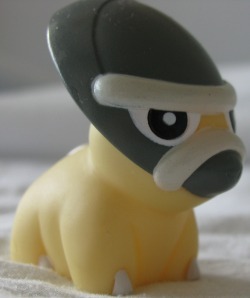 Firstly, I have always said that Shieldon never got a clear kid. Well, here he is! I saw him in a sales post, and that is the only time I have ever seen this little cutie. What a great stroke of luck! Also known as 'Mouth Open' Kid, because of his pouncing pose and little roaring mouth. I had quite a challenge getting hold of him! It seems this kid was under produced, so it took me several months to find. This little guy came from a group auction, and he was MIB when I recieved him. He's so cute and detailed, I was really glad to get him. For something that was produced right up until the end of 2008, this proved to be one of my hardest finds. For one thing he was a US only release, which made it impossible for me to find him on my own, but also he was discontinued before I started collecting him. 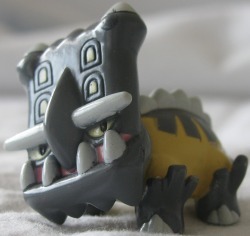 However, a store run on pkmncollectors saw him safely back to me, 2 years after his initial release! 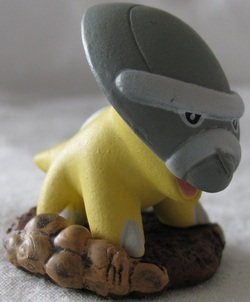 This was my first ever purchase on the pkmncollectors community. 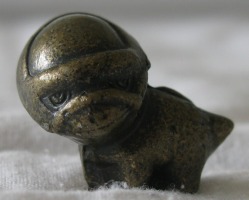 He's tiny, less than 1cm high, and very head-heavy, but he's just adorable in all his minisculeness! This is one huge Shieldon! He stands about 4 inches tall and 2 inches long, and has a poseable head. He towers over my other Shieldon figures, so we call him Godzilla. 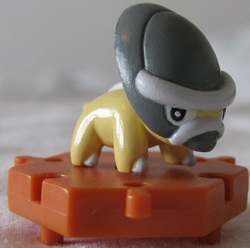 Now this is one cute little figure! 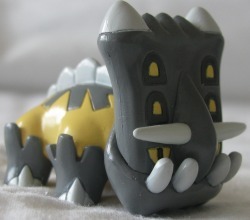 I was so pleased to find him and complete my Sinnoh Fossils chous! This is such an elusive thing to get hold of. Add in that I could only get it on eBay, and the seller wouldn't ship to the UK for less than $20, and it was even more elusive. Thankfully, a lovely PKMNCollectors member helped me out and middled for me to get it. It's very well loved in my collection! This marble came with the Jakks figure, mentioned above. I have two, and they're both super cute! LOOKATIT. So cute. 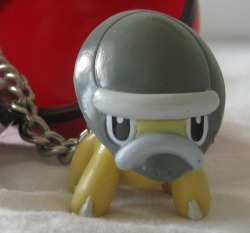 This is identical to the 2012 Pokédex charm above, but I just really, really wanted it nonetheless. This custom was made by silversnowcloak @ LJ. This photograph doesn't do him justice; he's beautiful! 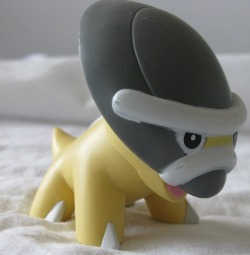 This is the normal Bastiodon kid, who stands about 2 inches tall and is made of hollow plastic. He was a lucky find on a pkmncollectors sales post. 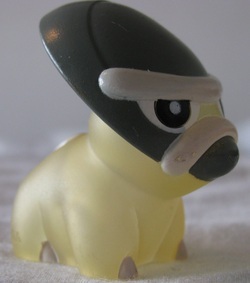 Here is the Attack kid, one of only 2 of this type in my collections. He's a lighter colour than the normal and DX kids, and shows Bastiodon performing what looks like Body Slam. I wouldn't like to be on the recieving end of that attack! 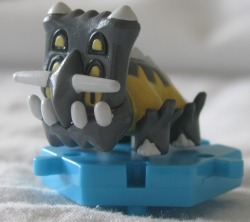 This is the biggest form of kid you can get, and they usually feature a moving part - sadly Bastiodon's movement is limited to turning his middle around and around, but still! 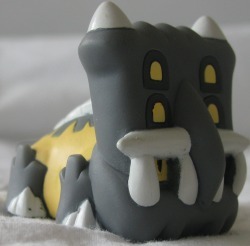 He's three inches long and two and a half tall, so a big Bastiodon for my collection. 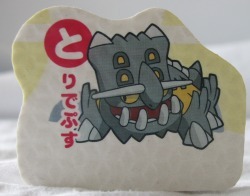 This little guy came direct from Japan via Sunyshore Pokémart. I love his details and, though his pose is fairly universal, it's still awesome, right? Right! 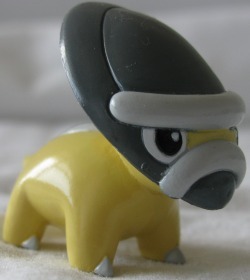 Clipping Figures are small figures which show the pokémon in dynamic or attack poses. 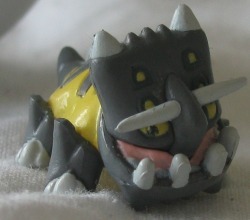 Here Bastiodon has his mouth open - maybe Metal Burst - and this figure is about an inch long and half an inch tall. 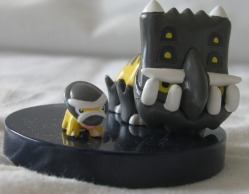 Yet another tiny Bastiodon, and a slightly different pose! Chou Gett are kind of the next step on from FCS, and are interlinkable via small pegs. They can come in a range of poses, and new sets are released very regularly. 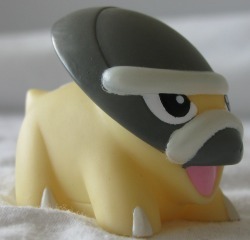 In the US and UK, the best way to get them is via Gacha machines, however this little guy came from LJ. Ohboy. 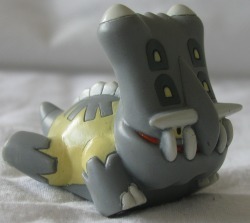 I saw this but just missed it on pkmncollectors, and wrote it off as a grail. THEN I found another one and snapped him up! 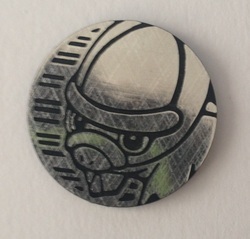 The picture is printed on some kind of plastic, which is then stuck to a piece of foam and moulded. Isn't the post on him just awesome? 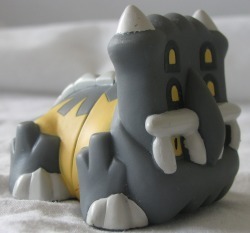 Tiniest Bastiodon ever? Yup! 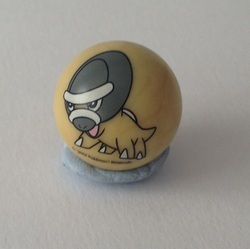 This little guy is made of plastic and is roughly a centimetre long and half a centimeter tall. Miniscule fossil!